By the early-1930s, a new generation of industry was establishing itself around the edges of Britain's towns and cities. This wasn't the heavy industry that had probably first come to mind when people thought of manufacturing in the 19th century. This was modern, light industry and it was producing all kinds of things – domestic appliances, personal-grooming products, and items connected with the growing car industry. 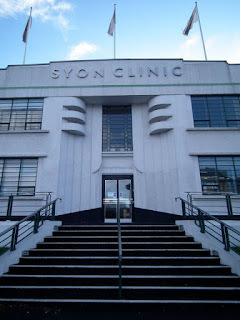 I've posted before about some of the 1930s factories that survive along the main roads of West London – especially Western Avenue and the Great West Road. 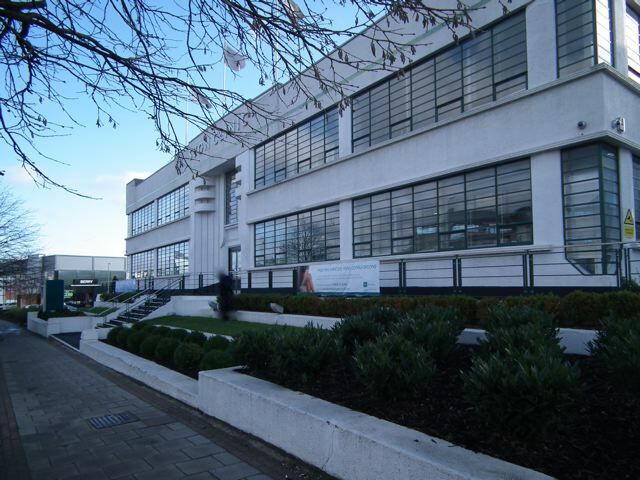 These buildings have gleaming white Art Deco fronts (containing offices, mostly) with larger, plainer, but well-lit workshops or warehouses behind. The fronts acted as advertisements, presenting a modern image on behalf of the owners and their companies. 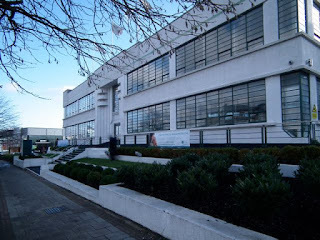 This example on the Great West Road began as the Coty cosmetics factory. Its white walls and strip windows speak of cleanliness and the latest decorative fashion of 1932. 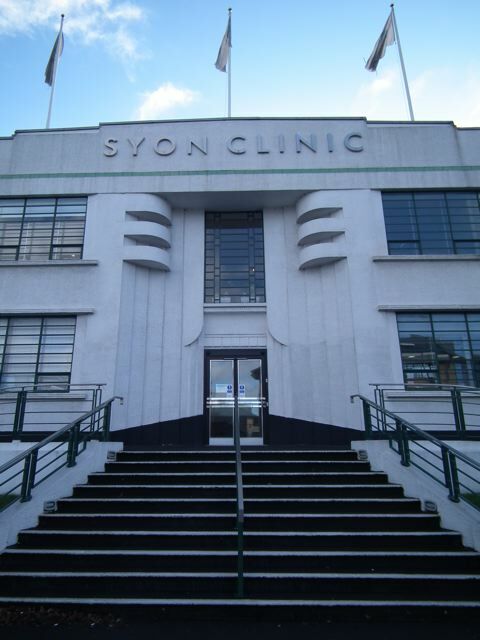 The building lacks the brightly coloured flourishes that appear on many Art Deco factories, but there are several telling details that show the architects, Wallis Gilbert and Partners, balancing decorative touches – their design is basically about setting up a rhythm of straight lines (windows, glazing bars, uprights) and then introducing just enough curves, steps, and diagonals to play variations on the grid. The stepped profile of the top of the facade and the detailing (both curves and verticals) around the entrance are key decorative elements. The way the glazing goes all the way up to the corners and the little angled detail on the lower edge of the corner windows is another telling touch. It's interesting that this kind of building, now surrounded by office blocks of the 1980s and 1990s in various, mostly postmodern, styles (with much mirror glazing and colourful cladding), now looks almost restrained. Apparently cared for and well used, these buildings of the 1930s have found a new way to stand out. In the bleak midwinter, with rain on rain in this part of the world, here's a photograph to remind us of last summer's sun, warming up the Cotswold stone at Wyck Rissington, northeast of Bourton-on-the-Water. Aside from the obvious charm of this stone building in its tree-lined churchyard, I'm attracted to this building for various reasons. Here are three things that interest me about it; three ways of looking at a building, if you like. First, the architecture. Although this is a small church, built by unknown masons and added to over the centuries in what looks like a haphazard way (look at the miscellaneous selection of window styles), it has had architectural pretensions, especially with regard to the chancel (in the foreground of the photograph). This small part of an obscure church represents a moment in English architectural history. It dates from the mid-13th century and the end wall, with its two pairs of lancet windows and small corner buttresses with pointed tops, is very much of its period. So is the surviving single lancet on the side wall (the larger windows are later; originally there would have been more lancets along this side). This was the period when English builders were beginning to group lancet windows together and add smaller openings (circles, trefoils, quatrefoils) above them to create windows with tracery – the window on the side wall next to the drain pipe is an example from a later phase of building. In the end wall, the two concave-sided lozenge-shaped openings above the pairs of lancets, and the plainer diamond opening above them, create a kind of proto-tracery, as if the masons were feeling their way towards this idea but not quite getting there yet: fascinating. Next, what has happened to the building recently, for all old buildings need care and repair, and how this is done affects both their survival and their appearance. On my visit in the summer, the church architect happened to be there making an inspection, and we talked both about the 13th-century architecture of the chancel and about the recent work on the church roof. 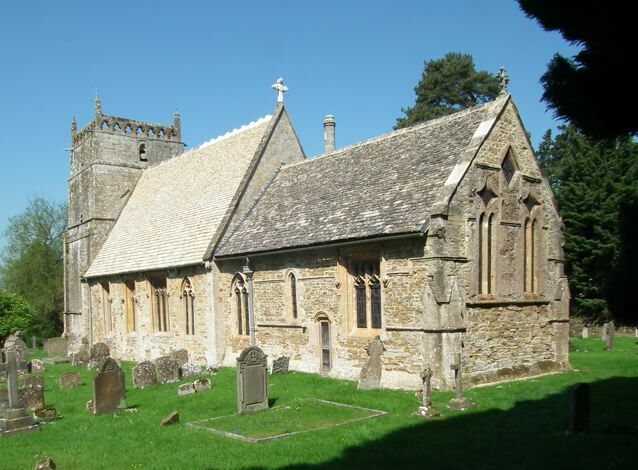 As you can see, the nave roof has been completely recovered in new Cotswold stone "slates". Some of the old slates were still in good enough condition to be recycled, as were quite a few on the chancel roof. So when the nave roof was finished, the chancel roof was redone with the best of the old slates. Both roofs are now good for many years, and the new slates on the nave roof will eventually darken in colour, attract lichen, and match the older ones on the chancel. Finally, a historical association, because the people who use old buildings are frequently just as interesting as the buildings themselves. 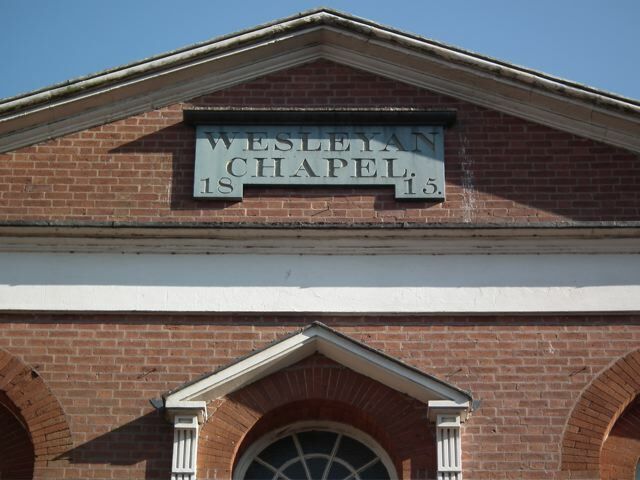 In the early 1890s, the 17-year-old Gustav Holst got his first job here, as church organist. He soon added a similar position at nearby Bourton-on-the-Water and this work helped to sustain the young composer until he got a scholarship to the Royal College of Music a couple of years later. Holst, who was born in Cheltenham, spent most of his adult life in London, but always loved the Cotswolds. One of his more ambitious works is his Cotswolds Symphony, the beautiful slow movement of which is subtitled "In memoriam William Morris". Perhaps his most familiar work, though, is one that many do not realise is by him, the tune called Cranham (named for another Cotswold village) which is the most popular music for the carol "In the Bleak Midwinter". Here it is, sung by that great British ensemble, The Sixteen. * Season's Greetings to you all. *Or there it was. The video I originally attached to this post has been removed from YouTube. There are plenty of other versions online, though, including one from the choir of Gloucester Cathedral, here. Having finished the book recommendations that have occupied the last few posts, I return to buildings – but without leaving the world of books and words behind completely, because the other weekend I went to a talk in Stroud by Phil Baines, who is a professor at Central St Martin's School of Art in London. He has written two excellent books on the design history of Penguin books (Penguin By Design and Puffin By Design) and is also an expert on all things to do with type and lettering. I had encountered him a few years ago when he led a tour of central London on an antique Routemaster bus, pointing out interesting bits of lettering as we went. During the course of the talk he mentioned that he had seen the Stroud Subscription Rooms (a 19th-century classical building by Basevi with its name high up in the frieze), and admired the lettering on them, which is a good example of a form of letter generally known as the Egyptian. In Egyptian letters the proportions are very similar to those of the English letter (see my earlier post on this), but the letters have slab serifs – rectangular, square-cut terminating strokes. The strokes often have a fairly even thickness, but if the letters are very chunky, the strokes can have some variation in thickness. Phil Baines encouraged us to go to the Subscription Rooms in Stroud, admire these letters, and pay special attention to the fine letter R. The letters stand out beautifully from the stone wall and Phil Baines was right, of course, to mention this letter; it has a lovely curve to the leg, which bends elegantly to avoid the large slab serif at the base of the descender. The two big slab serifs on the U, which nearly join together in the middle, and the big, generous D are attractive too. But the R is especially good, and in pointing it out, Professor Baines was showing us that he knows his Rs from his elbow. This is the book of the British Museum exhibition of the same name, which puts Shakespeare into his contemporary context by bringing together a host of objects gathered around a couple of handfuls of crucial Shakespearian themes (London, "Country, County and Custom", Kingship and the English nation, Rome, Venice, the Noble Moor, Scotland, the "Matter of Britain", the "Brave new world"). 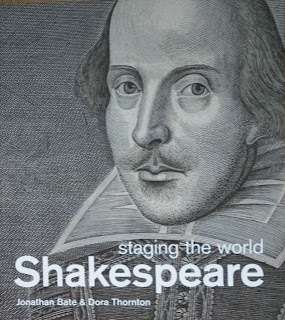 The authors, Jonathan Bate (one of the foremost literary scholars of his generation and the general editor of the excellent RSC edition of Shakespeare) and Dora Thornton (curator of Renaissance Europe at the British Museum) weave narratives around the themes and exhibits, so that we get the key information about the objects, some account of their historical importance, and an explanation of how their relevance to Shakespeare's life and works. The book is gripping on several levels. First, we get the chance to look at nearly 200 objects, mostly from the 16th and 17th centuries, mostly fascinating in their own right. Second, we discover how they illuminate Shakespeare. The illuminations can be very specific. For example, near the beginning of the book we are shown a document bearing Shakespeare's witness statement in a court case of 1612. The case concerns the Mountjoy family, with whom Shakespeare was a lodger. The Mountjoys were tire makers (makers of clothing or headgear) who had made "tires" for the queen; Shakespeare wrote plays for the royal court. Mrs Mountjoy consulted the astrologer Simon Forman; Forman went to see Shakespeare's plays and wrote about some of them in his diary. Another witness in the case was George Wilkins, who co-wrote Pericles with Shakespeare. The Mountjoys were Huguenots; Shakespeare wrote speeches for Huguenot asylum-seekers in his contribution to the multi-author play Sir Thomas More, a contribution that we know from the only literary manuscript in the poet's own handwriting that has survived – which is another illustration in the book. Most of the exhibits are contextual. These are not objects that belonged to the poet, but they are the kind of thing he would have owned, or handled, or known about, or they illustrate things that go on his his plays. A strip of tapestry designed to go around the top of a four-poster bed is woven with scenes of country life – people hunting, chatting, canoodling, playing the bagpipes – it could be the Forest of Arden. A calf-s heart stuck with pins looks like the kind of thing the witches in Macbeth might have used. A rapier with a blade made in Toledo recalls Othello's choice of suicide weapon, "a sword of Spain" – Othello has selected a weapon that is sharp and well made but also beautiful and obviously an object of quality; his choice of sword is almost a fashion-statement. Pictures of wild men who could be Calibans; a schoolboy's caricature of his teacher recalling the schoolmaster in The Merry Wives of Windsor harping on the "focative" case; Henry V's saddle (or, as the book carefully says, "Early fifteenth-century saddle, perhaps associated with the funeral of Henry V in 1422"); boar-shaped badges of followers of Richard III ("the most deadly boar"); a glass enamelled with masquerade figures including a "lean and slippered pantaloon" who could be a relative of the one Jacques speaks of in his "Seven ages of man" speech in As You Like It. These are the kinds of objects we encounter in this book. In the exhibition there were videos of actors speaking chunks of the plays. The book quotes the plays a lot, and we are never far away from the scenes and characters that inspired this whole exercise in the first place. 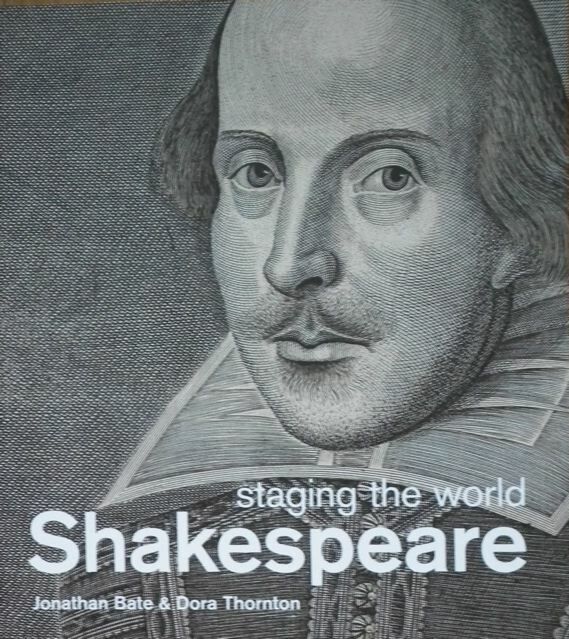 Perhaps the imagery in the book, and its arguments about their contextual relevance to Shakespeare, work best when several examples illuminate a specific part of the Tudor world. The glass with the pantaloon is marvellous, but when there are multiple images and examples – the varied portraits of people of colour, for example, and those of Jews, the depictions of London (some familiar, some less so), the oaks, stagshorns, watering pots and tapestries from the English countryside, and the images of kingship, I feel I am back in the rich and ambiguous world that Shakespeare staged. Tudoresque – shorthand for the architectural style typified by black and white walls and prominent gables – is something of a national obsession in Britain, and a symbol of our culture. But its modern incarnation, mock Tudor, is decried for the fakery of stuck-on beams and imitation leaded lights. So why are we so preoccupied by it – whether we're in love with it or, like many design professionals and architects, scornful of its suburban manifestations? This is among the questions that Andrew Balantyne and Andrew Law (professors respectively of architecture and town planning) seek to answer in this lively book. They trace the style's 16th-century roots, its various reincarnations – during the vague for the "Picturesque" in around 1800, as a revivalist style (influenced by the Arts and Crafts movement) in the late-19th century, and as mock-Tudor suburban architecture in the 1920s and later. Fascinatingly, Ballantyne and Law also trace the style's meanings for its revivers – those values that it has seemed to embody and that have been attractive to lovers of Tudoresque down the ages. It turns out that these meanings are far from simple. 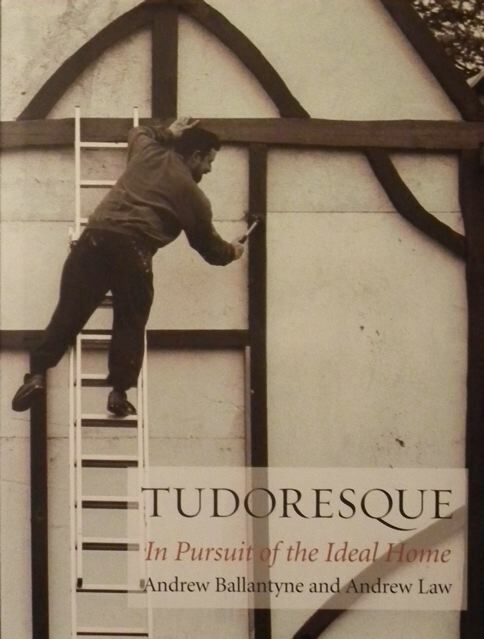 On the one hand, there is the Tudor style as a symbol of paternalistic old values: of manor houses, aristocrats who look after their patch and their servants, benevolent industrialists housing their workers. This is one-nation Tudorism, if you like, with a lavish portion of the roast beef of old England. From another point of view, it's the style of self-reliance, of the lower middle class making ends meet, of squatters putting up a timber-framed house on common ground overnight and claiming the right to live there, of the Elizabethan ideal of a cottage with four acres of land, of suburban owner-occupiers. Ballantyne and Law tease out these meanings carefully, showing that if such subtexts are no longer directly relevant (few people build and squat nowadays) they are still there somewhere in our unconscious, and they contribute the way in which we see things. If Tudoresque cottages appealed to the creators of the Picturesque landscapes of the 18th and 19th centuries, symbolizing patriotism, they also embody values of tradition and Britishness to many dwellers in modern half-timbered homes. The authors also look at the vogue for Tudoresque in other countries, where it is seen in part as a symbol of Britishness and British values, whether in the swanky abodes of early-20th century US industrialists or in smaller Manhattan apartment blocks, which occasionally resemble Tudor skyscrapers. Tudoresque pulls all these threads together well. It encompasses real timber-framed buildings and faux-Tudor houses with boards nailed on to brick walls, and shows that what they have in common is more than skin-deep. It made me think more deeply about why people built these houses the way they did, about the gulf that sometimes opens up between architects and home-owners, and about what makes Britain British. The Pinecone is a biography of Sarah Losh, heiress in a prominent family in the northwest of England, and creator of the church of St Mary in the village of Wreay, south of Carlisle, one of the most extraordinary buildings of the 19th century. Sarah Losh is interesting for all kinds of reasons – for her local philanthropy, for her connections with many of the luminaries of the 19th century from the poet Wordsworth to the engineer George Stephenson, for her role as a woman architect in a man's world. and for the visionary design of her church, a building that has been puzzling people ever since it was built in the 1840s. Jenny Uglow tells this story with intelligence and verve. She is sometimes hampered by the fact that most of her subject's papers have been destroyed – never mind the creation of a remarkable building, Uglow's biographical task occasionally seems to be like making bricks without straw. But she is helped by being able to look at Losh through her links with others. So we see Losh hearing poems read by Wordsworth and Coleridge before publication, paying calls in Carlisle and in Newcastle, where her family were prominent manufacturers, learning from her radical uncle James (friend of William Godwin), and interacting with her beloved sister Katharine, whose early death cast such a shadow over her life. For this is also one of the great sibling-bond stories, joining William Wordsworth and Dorothy, Jane Austen and Cassandra, William Herschel and Caroline. Above all there is her church. St Mary's Wreay looks more like a work of the Arts and Crafts period of the1880s than a building of the 1840s. But not even the Arts and Crafts produced a structure quite like this, covered with carvings that are far outside the usual church orbit – a tortoise gargoyle, a crocodile, a dragon, lotus buds, gourds, and pinecones (the latter symbolic variously of creation, reproduction, enlightenment, the spirit of man, and the expansion of consciousness). There are carved angels, it is true, but you have to look hard to find much traditional Christian imagery. 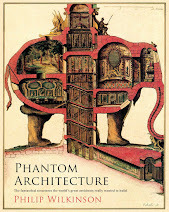 It is as if Sarah Losh, having daringly entered the male preserve of architecture, looked at the whole business from a different viewpoint, that of a kind of pan-religious perspective, where all faiths are as one. 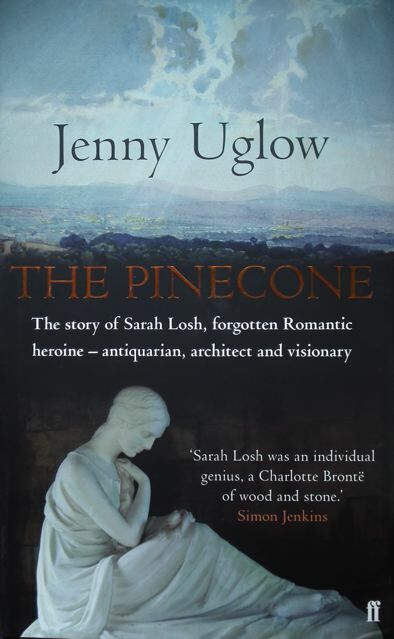 By describing Sarah's church in such detail, Jenny Uglow also describes her somewhat elusive subject, Sarah herself and her concerns. The church is an act of making and also an act of mourning (for Sarah's parents and sister and other family members); it is both a gathering together of diverse religious symbols and a very specific act of benevolence to the village of Wreay itself, to which Sarah also contributed a school and numerous hand-outs in times of need; it is both a display of traditional craftsmanship and an artistic bolt out of the blue. Uglow's book nails all this – but does not lose sight of the oddity of the place or the elusiveness of its creator. It's not like London buses. You wait for years for a book by Jonathan Meades and then just one arrives. Museum Without Walls.† It's a collection of pieces – essays, TV scripts – some of which the dedicated follower will have encountered before. A grab-bag then, containing 54 bits of journalism and six scripts. What unifies them is a preoccupation with places, which Meades calls the "greatest free show on earth". Peel off the jacket of this book and you will see embossed into the cloth of the binding a guiding maxim: "There is no such thing as a boring place." The book richly embodies this notion. A grab-bag? It's the commodious valise of a thoroughgoing topophile. They're not the usual guidebook places and they are not, for the most part, the places seen or valued by architects. A lot of what interests Meades lies at what some writers call "marginal" places and spaces: asbestos dumps, collapsing Nissen huts, stretches of tidal mud, flaking Portakabins, allotments, "a petrol pump pitted and crisp as an overcooked biscuit". To many of course this kind of thing is far from marginal, it's just marginal to "heritage", to architectural commentary, to curatorial neatness. 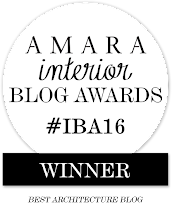 Such places need a keen eye to notice them and a bracing prose style to conjure them up in our mind's eye, our mind's nose, and the rest. 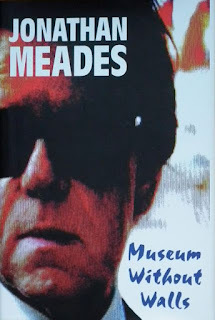 Like Iain Sinclair (and like Richard Mabey in such books as The Unofficial Countryside) Meades has what it takes. A lot of the familiar Meades themes are here: the centrifugal quality of London, the similarities between the 1860s and 1960s, the ignorance of the countryside that lies behind the Picturesque movement and the corrosive effect of that movement, the deleterious consequences of our love affair with the suburbs, the delusions of the religious, the scandal of regeneration disguised as atrocious government-funded sub-architecture, the tiresomeness of lowest-common-denominator postmodernism ("oafish pediments"), the blinkers through which we see building materials (why is stone better than concrete or corrugated iron? ), the delusive hierarchy of building types (why are churches better than factories or sheds? ), the glories of shacks and bricolage, the fascination of terrain vague, and so on. And all of this is described, discussed and dissected in prose that is assertive, bracing, in-your-face, logophilic, and sometimes very funny. There are also some tender passages in which Meades writes about his boyhood – First Love, First Shack – and places that played a special part in his young life – pub car parks near Evesham, the confluence of the Wiltshire Avon and the Nadder, Salisbury, Portsmouth, the New Forest, a valley that the young Meades identified as the Valley of the Shadow of Death. †Is this title derived from The Voices of Silence, the vast theory of art by French writer and politician André Malraux, which has a section called "Museum Without Walls"? Maybe. It's a long time since I read Malraux, but "Museum Without Walls" is his term for the illustrated art book, and he shows (amongst other things – Malraux's is a long and complex and, some would say, windy book) how it liberated us from the confines of the art museum, allowing us to put art in new contexts and to see it free from the blinkers of convention. Meades, on television and in his journalism, does something similar. But to write about buildings and call your collection Museum Without Walls is of course to play both on words and on walls. §Museum Without Walls is published by Unbound, the crowd-funded publisher. I must declare an interest in that I was a member of the large crowd who helped fund the publication. 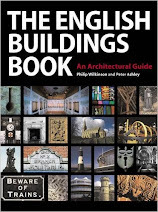 For the next ten days or so, the English Buildings blog becomes a book blog, as I look back at a few of the books I've enjoyed this year, potential Christmas presents, perhaps. 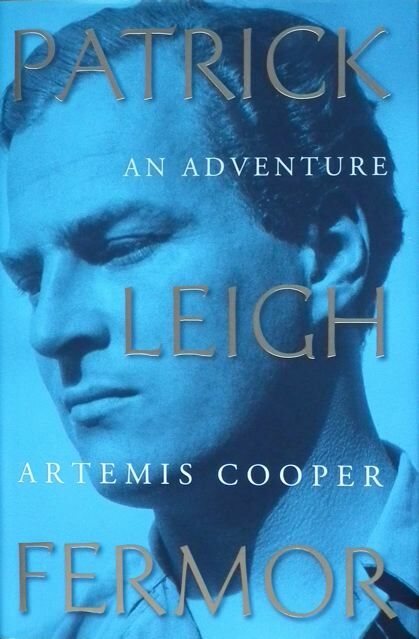 I've chosen books relevant in some way to the main concerns of this blog – buildings, history, places – and, to begin with, a biography of one of the greatest writers about places of the last hundred years or so. Left as an infant to grow up with strangers, expelled from various schools, cast adrift and footloose in London, walked from the Hook of Holland to Constantinople aged 18–19, slept in barns and castles, fell in love with Rumanian princess, joined Greek cavalry charge, kidnapped German general in occupied Crete, won DSO, travelled in Greece, settled in Greece with Joan Rayner, wrote award-winning travel books, lauded as best travel writer of his generation, swam the Hellespont aged 69, died aged 96 after a triumphant life lived on his own terms. Something along those outlines represented what most of us knew of the life of Patrick Leigh Fermor (Paddy, universally) – that, and what mattered: his two stellar books on Greece, Mani and Roumeli, and his luminous account of his walk to Constantinople in A Time of Gifts and Between the Woods and the Water, the first two parts of a projected trilogy, the third part of which never appeared. The baroque prose, the breadth of learning, the delight in and knowledge of languages, the sense of place, the understanding of people: all were in a class of their own. In Patrick Leigh Fermor: An Adventure Artemis Cooper has filled in the outline and fleshed out the life behind the works. It must have been a challenging task, given that Paddy has said so much about his life in his own books. His bejewelled prose is a tough act to follow. But she has done well, building up the details, throwing light on some of the obfuscations, and maintaining a pace that makes the book compulsively readable. Her biography gives us: a clearer account of Paddy's infant life with his surrogate parents in Northamptonshire than the brief one in A Time of Gifts, plenty of detail about his wartime service and life, a moving description of his reunion with Princess Balasha after war and the corrosive effects of communism had kept them apart for decades, quite a bit on his colourful love life, and plenty of detail about the gestation – both painstaking and painful – of his books. I have enjoyed discovering that my hero had his faults, which were the ones, mostly, that I'd suspected – a certain thoughtlessness sometimes (amidst much true consideration for others), a know-all quality, an occasional tendency to tweak the facts about his travels (though not the essential facts: it did all happen). Oh, and a troublesome capacity to keep publishers waiting. Every fan of A Time of Gifts and Between the Woods and the Water knew about this. Where was the sequel? Years went past, and decades: still nothing. Paddy was "working on it", it was "almost ready", and so on. Artemis Cooper deals rather briefly with the last part of Paddy's life. Even for someone as energetic as Paddy, the pace of life does slow as one reaches one's 70s, 80s, and 90s, so this brevity is forgivable and understandable – yet, was there really no more to say than some 40 pages on the last four decades of his life? However she does address the important question of the "missing" third instalment of the great walk. Briefly, back in the 1960s Paddy had drafted an account of the last part of the journey, but he remained unsatisfied with it, unable to recast it into a form that he felt good enough. His feeling that he could not live up to the quality of the first two books depressed him, and there were deep clouds over his last years. That enviable life was perhaps not so idyllic after all. Artemis Cooper has set this on the historical record, where it belongs. She also holds out hope that an edited version of Book Three of the journey will be out in about a year. She deserves our thanks for that, and for an enjoyable and generous biography. Little things can make a big difference. When it comes to architecture, one of those little things is the quality of the lettering used in signs, inscriptions, date stones, and the rest. Here's an example that caught my eye: the name and date stone on a chapel in the centre of Leicester. To harmonize with the classicism of the building the person who cut this inscription used what Alan Bartram, authority on lettering on buildings, calls the English letter. What he means is a letter form in which there is quite a big difference between the thick and thin strokes and in which the change from thick to thin in, for example, the curving bowl of the C here, or the P, can be quite sudden. On the whole the thick strokes are verticals. The serifs (the tiny protrusions at the ends of the main strokes) are generally bracketed, in other words the main stroke flows into them. But in this particular example the bracketing is quite subtle in some of the letters. 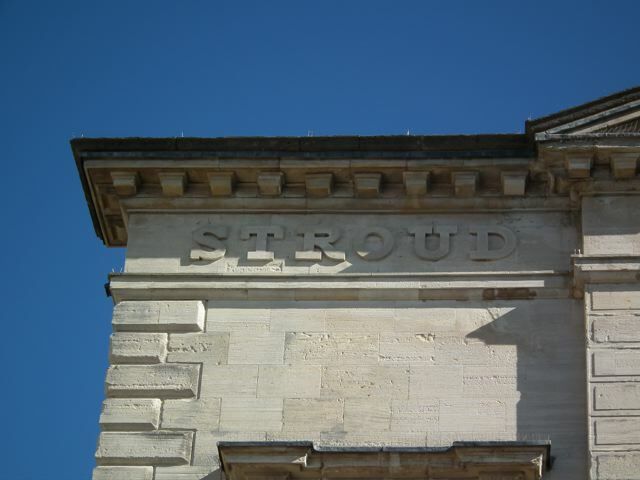 You can find English letters all over Bath, where they are used for the street names, which are carved directly into the stone walls. Elsewhere they pop up in all kinds of places, and are often, as here, to be found when you look up. They vary quite a bit in style –some have less heavy thick strokes than these. Many have fuller serifs. But if the letters are well proportioned and evenly spaced, they are all satisfying. Especially in the sun. 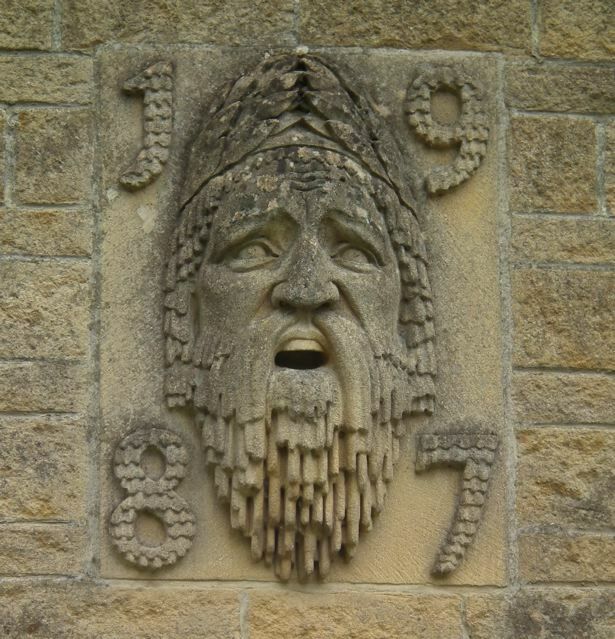 This is a brief pendant to the previous post about a terrace in Bath and its keystones carved in the form of icemen. A correspondent pointed out that the exuberant carved decoration on the Bath terrace might well be an expression of impatience with the austere classicism of much Georgian architecture, an exercise in lightening up and putting on the frills. I think that rings true. Here is another bit of ornament in a non-classical, but equally unexpected, context. On a recent Cotswold walk a friend and I crossed a field on a downhill stretch towards a familiar road and missed the proper footpath by a couple of hundred yards, arriving roughly where we wanted to be but by a different, unofficial route. As we did so, we passed a tiny stone building of unknown purpose. 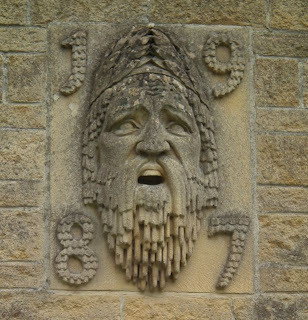 The only remarkable thing about it was this rather fine date stone, complete with a mask that is surely, if I'm right in seeing icicles in the beard, a distant modern cousin of the Bath icemen. Whoever he is, he was a pleasant surprise.